American University’s Center for Latin American & Latino Studies has released the results of a new report that assesses the gains and challenges of the Mission in Support of the Fight Against Corruption and Impunity in Honduras. MACCIH was launched in 2016 under the auspices of the Organization of American States, in response to civil society mobilizations to demand an end to rampant corruption, including the illegal appropriation of public funds for political campaigns and the personal enrichment of elites. It aims to assist Honduran prosecutors in the investigation of corruption and to bring perpetrators to justice. Based on dozens of interviews conducted by Call and CLALS researchers with stakeholders and analysts in Honduras, Guatemala, and the United States, the report surveys the difficult landscape that MACCIH has encountered, and details the significant obstacles presented by Honduran political elites and by the OAS itself. 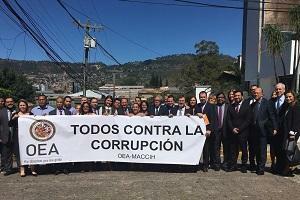 The report also compares MACCIH to its counterpart International Commission Against Impunity in Guatemala, and analyzes the politics of international anti-corruption missions themselves. MACCIH was founded through an agreement between the President of Honduras, Juan Orlando Hernández, and the Secretary General of the OAS, Luis Almagro, in response to a series of street protests that denounced the government’s involvement in embezzlement from the country’s largest health institution, the Honduran Social Security Institute. Tens of thousands of Hondurans marched to demand the establishment of an independent, international mission similar to the United Nations-sponsored CICIG, which successfully prosecuted and jailed the Guatemalan president and high-level public officials involved in corruption scandals. Many Hondurans hoped that the international monitoring mission would help to fight that nation’s endemic government corruption and that it would lead to the ouster of President Hernández. “Given the importance of the mission to the people of Honduras and to the struggle against impunity and corruption across Central America, CLALS and its team of researchers will continue to offer rigorous academic and analytical information on the work of MACCIH,” said Eric Hershberg, Director of CLALS. The current report was made possible by a grant from the Open Society Foundations. More information about this project can be found on the project website.